Ms. Mendes is a licensed and board certified psychiatric/mental health nurse practitioner in psychiatry. She received her first degree, a bachelor of arts in psychology, from SUNY Purchase and a second degree, a bachelor of science in nursing from Pace University, Pleasantville. Then she went on to complete her master of science degree from Columbia University’s School of Nursing in Adult Psychiatry. Her training for her graduate degree and licensure was varied throughout Manhattan and Westchester County, including formal training at Four Winds Hospital in Katonah, NY. She most recently has worked for VNSNY in Community Behavioral Health, as well as for Chappaqua Behavioral Medicine overseeing outpatient mental health treatment. Ms. Mendes has extensive experience in multiple disciplines as an RN and most recently worked as the executive director of the Greens at Greenwich, a facility that specializes in residential care for clients with dementia/Alzheimer’s disease. 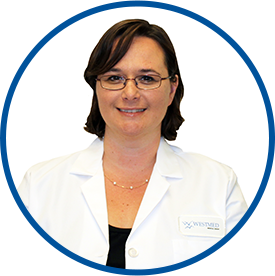 She joined Westmed Medical Group June 2014 and treats adults. Audra is amazing. one of the best providers i have ever seen. she has had a huge impact on my well being and i live well now becuae of the treatment i recieved with her. All good experiences - I have seen for one year & she is great. *Audra is excellent! I feel that she listens, is knowledgeable & VERY helpful. Audra Mendes is a Godsend, I am so grateful for her knowledge and could not be happier to have found my care in her. Audra Mendes is one of the best providers. She's very knowledgeable and experienced. Also, Audra is very compassionate and warm person. Because of all these qualities, I feel better. Audra is an amazing healthcare provider. I recommended *Ms. Mendes to my cousin.